Like you, I too have struggled with all my might against oblivion. Like you, I have forgotten. Like you, I have longed for a memory beyond consolation, a memory of shadows and stone. I have struggled every day with all my might against the horror of no longer understanding the reason to remember. Like you, I have forgotten. Why deny the evident necessity of remembering? Guillermo Cifuentes. El Rumor (The Rumor). Installation. 2000. Julieta Hanono. El Pozo (The Well). Video. 2004. Why deny the evident necessity of remembering? 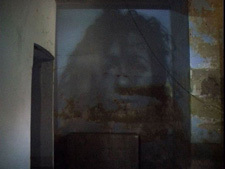 For Ireneo Funes, the main character in Jorge Luis Borges' shortstory Funes el Memorioso (2), remembering is an unbearable exercise, a torture. Every instant, every detail builds up in his mind, fills up his head with data and images hated and avoided until exhaustion. Memory torments him. Funes is a martyr of the incapacity to forget. Conversely, Leonard Shelby, the main character in Memento (movie by Christopher Noland, 2000), is tormented by his incapacity to remember. His brief moments of awareness are object of a patient recording work. Images and words accumulate on his body, fill his pockets and invade his room. While the world punishes Funes with its wounding impressions, Leonard lives in a non-existent reality. How is the articulation between data and the world, between images and reality? To what extent does the lack of certain words, certain sounds, certain representations invalidate the possibility of conveying a sense to reality destroying, in the limit, its very existence? An ominous voice constantly announces the elision of some words from the dictionary in Jean-Luc Godard's film Alphaville (1965). An invisible authority intends, by eliding words, to elide that which they represent. Such surreptitious power is taken further in the film Fahrenheit 451 (1966)(3)by Fraçois Truffaut. Here, it is the tales, stories, cultural traditions and chronicles accumulated over years that are the object of programmed, systemized, and controlled disappearance. Are these metaphors of a power that exceeds the political field to operate on minimal reality, on people's lives, creations and values? Or representations of power itself, of its modus operandi, its circulation circuits, its application points, its strategies? Within this context, is retaining images, words, gestures and metaphors a way of resistance? It no doubt is, but in a much deeper sense than initially seen. Foucaultian theory has evidenced this microphysics of power (4), the intimate interrelationship between bodies, things, representations, symbols, and discursive existence. This microphysics very precisely articulates the relationships between the visible and the invisible, between that which is hidden and that which is disclosed, between that which can be said or named and that which remains in the darkness of language. "The exercise of discipline presupposes a mechanism that coerces by means of the gaze –states Michel Foucault in Discipline and Punishment (5)– an apparatus in which the techniques that make it possible to see induce effects of power and in which, conversely, the means of coercion make those on whom they are applied clearly visible." In The Order of Things (6)he asserts, 'the theory of natural history cannot be dissociated from that of language. Nor is it about a method transfer from one to the other... it concerns a fundamental arrangement of knowledge of beings so as to make it possible to represent them in a system of names." Power and knowledge are so closely intertwined in Foucault's work that any power effect goes hand in hand with a production of knowledge and viceversa. Seeing, hearing, speaking, representing, perceiving are, at the same time, basis for artistic manifestations. We could then think that power relationships generate aesthetic effects and, conversely, that artistic and cultural expressions –where ways of seeing, showing, telling, hearing, symbolizing, signifying and naming are developed­– display power effects. In his book Le Partage du Sensible. Esthétique et Politique (7), Jacques Rancière develops the idea of an aesthetic basis of politics. For the French philosopher, politics is structured on a distribution of the sensible, on the ways that each time allows seeing, hearing, perceiving, naming. In his own words, "(The distribution of the sensible)... is a partition of times and spaces, of visible and invisible, of word and sound, that simultaneously define the place and position of politics as a way of experience. Politics rest on what you can see and say, on who has the authority to see and the capacity to say, on the ownership of spaces and possibilities of time." In this way, there is a political effect in the disclosing for viewing, in recovering lost or hidden images and sounds, in the very act of re-presenting. Beyond the political "content" of an artistic production, we can speak of its political effects, of its capacity to organize a field of sensible experience affecting those who perceive it, restructuring their relationship with power-knowledge and ultimately, transforming their sense of what's real. 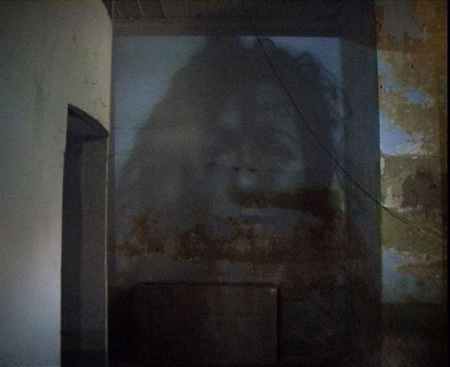 From this perspective we could rethink the ways in which it can be dealt with, from the artistic practice, a non-specific phenomenon such as the last military dictatorship in Argentina, its unique existence and the necessity of remembering. Definitely, it will always be important to go deep into historical data, documentary images, testimonies, the traces of experiences and horror. Firstly, because hiding these facts and documents has been the main strategy for blocking this episode in our history, denying its reality. But also, because its disclosure broadens the terrain of that which is visible and that which can be told regarding this specific fact. Nevertheless, within artistic practice, this is not enough. Beyond what is shown, what it represents or says, it also seems necessary to explore new ways of making things visible, conveying meaning, referring, connoting or telling. Ways of transcending the dependency of images on records, the dependency of words on documents and testimonies, the dependency of sounds on reconstruction or evocation. Other images, words and sounds that, in the dialogue with history and memory, expand our conscience and our visits to a past which, instead of illuminating from the accumulation of information and tales, seem to increasingly suffocate on a constant repetition of the same images and the same sayings. Film, video, photography and sound recordings are register media. There is a strange belief that, as such, they can only answer to the moment when they were recorded, that their existence depends on an unavoidable present, which is the moment in which they were created (8). Nevertheless, even from a strictly materialistic perspective, this is a limited vision. As products of a mediation process, they are the result of multiple translations, filtering, clippings and adaptations. This selection and organization task –that is sometimes due to the technological device itself (9) while other times relay on the creator/operator– is similar to how memory actually works –except in the case of Ireneo Funes. It is not a coincidence, perhaps, that in the field of information sciences, all records, documents and files have the memory of the computer as their destination. We could then wonder if records produce memory exactly because they operate just like it, because they not only technically translate facts but also some ways to approach them. Furthermore, all records, images, sounds and words access a universe of significance exceeding the level of evidence when used by artists. It is precisely on that level where we can expect a redistribution of the sensible that transforms the ways of perceiving, hearing and seeing. Should there be a chance of casting more light onto certain relevant facts, should we be able to think about new readings and points of view of given situations, facts or characters locked in history or memory, then perhaps we should not wait for them to stem from a comprehensive reviewing of existent records but from new aesthetic configurations, new uses of existent realities, new transformations of the sensorial spectrum. Contemporary art set to tackle this task long ago. Convergence of images and words from the past, recovered memories, evoked facts, speculated sounds, known facts, sensed horrors, unhealed wounds, lost lives, insurmountable ignorance with the will to cultivate ways to neutralize the anodyne repetition, official stories and the progression of forgetfulness, finds in the current artistic production a space of pure potentiality. Because, after all, it is not about recovering the past, as if that were possible. We can only intend to recall it from the present, from the place taken by who invokes it. "Men cannot see beyond their own face; everything speaks of themselves," stated Karl Marx (10). In the foreword to Páginas de Historia y de Autobiografía by Edward Gibbon (11), Borges provides us with another key, this time referring to the relationship of the record and its past: History is not that which is written; history is what is made, and then it is not even History, but Aesthetics: "(we must admit) the fact, perhaps even melancholic, that after a while historians become history themselves, and (when we read a History book written by an English man from XVIII century) we don't care much about Attila's campsite, but how an English man from XVIII century would image Attila's campsite to be. There were times when Pliny's writings were read in the search of precisions; today we read them looking for wonders, and that change has not altered Pliny's fortune." Perhaps memory itself is less related to History than to Aesthetics. 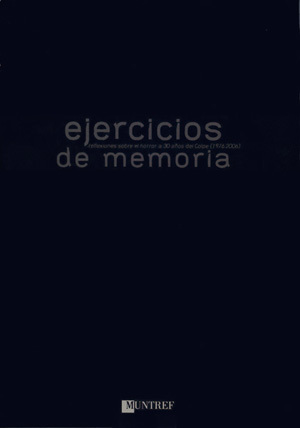 Ejercicios de Memoria (catalogue). Buenos Aires: MUNTREF, 2006. (1) Part of the film Hiroshima Mon Amour (1959) by Alain Resnais, on texts by Marguerite Duras. 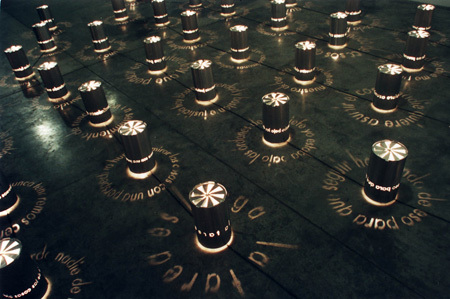 This quotation is also part of the work September 11th (2002) by Claudia Aravena, included in this exhibition. (2) Borges, Jorge Luis. "Funes el Memorioso" (1942), in Borges, Jorge Luis. Ficciones. Buenos Aires, Emece, 1956. (3) Film based on the homonymous short story by Ray Bradbury. (4) To broaden the concept, refer to Foucault, Michel. Microfísica del Poder. Madrid, Ediciones de la Piqueta, 1992. (5) Foucault, Michel. Vigilar y Castigar. México, Siglo XXI, 1996. (6) Foucault, Michel. Las Palabras y las Cosas. México, Siglo XXI, 1995. (7) Ranciere, Jacques. Le Partage du Sensible. Estétique et Politique. 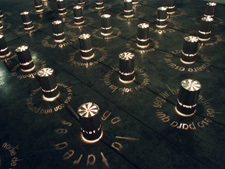 Paris, La Fabrique, 2005. (8) This belief was fed greatly by the analysis of photography by Roland Barthes in Camera Lucida (Barthes, Roland. La Carama Lucida. Barcelona, Paidós, 1995). (9) Vilem Flusser considers that there is participation both of the apparatus and of its program (or programming) in the final product of the photographic act. Refer to: Flusser, Vilem. Hacia una Filosofía de la Fotografía. México, Trillas, 2000. (10) Quoted in Debord, Guy, "Teoria de la Deriva", in Internacional Situacionista. Vol. 1. La Realización del Arte. Madrid, Literatura Gris, 2001. (11) Borges, Jorge Luis. "Prólogo a Páginas de Historia y de Autobiografía de Edward Gibbon", in Borges, Jorge Luis. Prólogos. Buenos Aires, Torres Aguero, 1975.